Magnesium Chloride Flakes are retrieved from salt lakes in Western Australia and South Australia under strict guidlines. Magnesium is important to all body functions and can be absorbed through the skin to raise magnesium levels. Read on for how to make your own magnesium oil spray and use magnesium in bath soaks and body care products. Do not use on broken skin. 80g. Please note, your glass jar may be smooth glass or diamond textured. Also available in 800gm Magnesium Flakes bags here. Equal part of magnesium flakes and distilled water. Place flakes in an oven proof glass dish water and slowly pour in boiling distilled water. Stir to dissolve. When cool, put into spray bottle or use to make your own magnesium body care. Distilled water is important to help stop the growth of bacteria, but it also means there are no chemicals such as chlorine and fluoride. Technically it is not an oil. It simply has an oily feel to it. Epsom salt also contains magnesium sulphate and can be used for similar purposes, though the magnesium chloride is more popular for topical application as it is less drying. Naturally boost your magnesium levels. Magnesium is important for the healthy function of the brain, heart, bones, muscle contraction, and energy production. It is more readily absorbed through the skin than orally. Relieves tired and sore muscles. Promotes relaxation and the healthy function of the lymphatic system. By balancing the skin's PH levels, a magnesium bath will soften skin and relieve symptoms of general skin conditions. 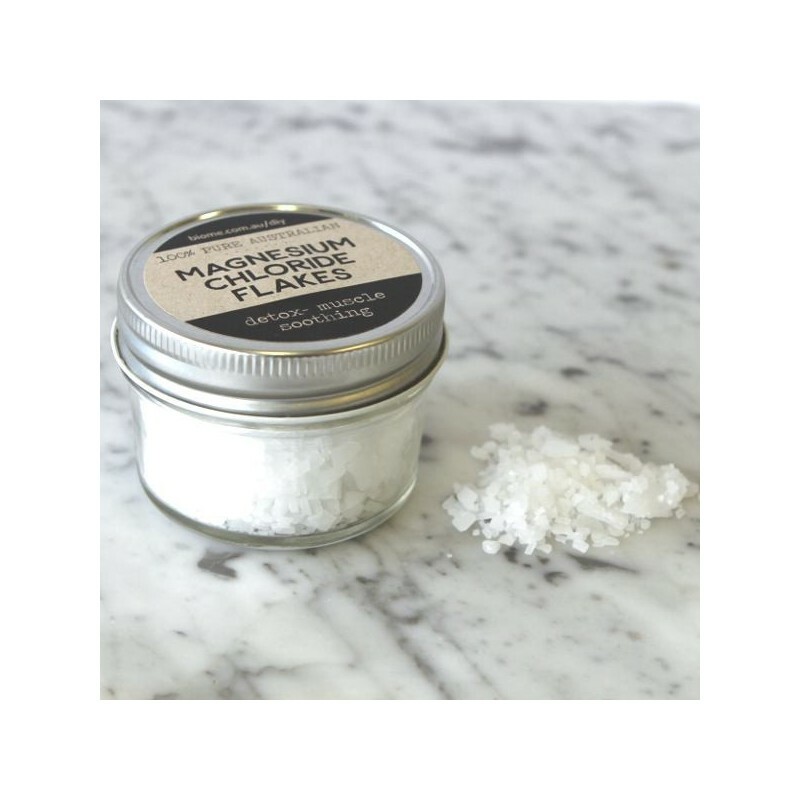 Soaking in a magnesium flake bath can relieve sore muscles, detox and provide lymphatic support. Suitable all skin types but do not use on broken skin. First few topical applications of magnesium can sting, particularly if you are deficient in magnesium. Dilute magnesium in lotions or deodorant for less irritation. Magnesium is a good alternative to bi carb (sodium bicarbonate) in natural deodorants for those who are sensitive to bi carb. Deodorant - either Magnesium Spray Deodorant (simply mix 100ml homemade magnesium oil plus 10 drops of preferred essential oils) or Deodorant Paste. Please Note: Information used in this product description is not intended to diagnose, treat, cure or prevent any disease. If you are concerned about your Magnesium levels, please consult your GP. Use only as directed, if symptoms persist see your healthcare professional. I used this in gifts for teachers at Christmas. Mixed with sugar, salt and peppermint oil it made a great scrub and bath salt. I was really excited to find these available as I use magnesium oil for restless leg syndrome every night. 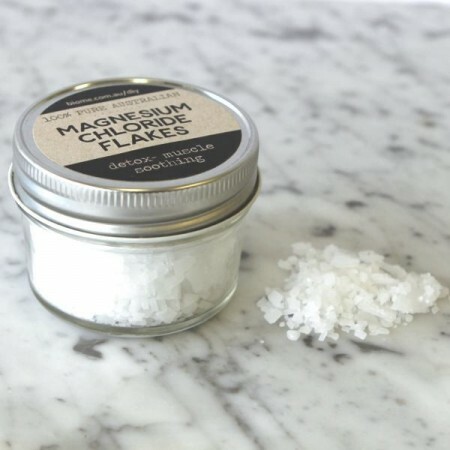 It's great to be able to use these flakes to make my own magnesium oil for a fraction of the price that it sells for at the chemist, and with a higher concentration of magnesium chloride. Great value.